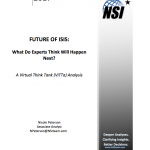 Future of ISIS: What Do Experts Think Will Happen Next? Author | Editor: Peterson, N. (NSI, Inc.). At its zenith in 2014, the Islamic State of Iraq and Syria (ISIS) controlled more than 100,000 square kilometers of territory. ISIS seized control over major cities, notably Mosul and Raqqa, which contributed to increasing disorder in the Middle East. 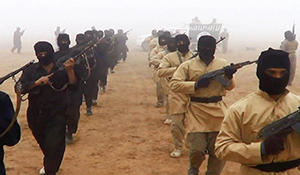 As late as 2015, the geographic reach of ISIS appeared to pose serious threats to the territorial integrity of Iraq and Syria as well as the physical safety of citizens in the region. Nonetheless, as of June 2017, estimates show that about 90% of Mosul had been liberated as Iraqi forces, in coordination with the Coalition, while they continued to regain large portions of the western part of the city. Similarly, a battle to retake Raqqa is in progress. US officials estimate that only around 2,000 ISIS fighters remain in the city, while US-backed Syrian Democratic Forces (SDF) and Coalition forces total around 55,000 fighters. Given these developments, ISIS is likely facing the end of its territorial rule. Subject matter experts’ hypotheses about the future of ISIS have similarly evolved with changes in ISIS’s geographic holdings. Two years ago, experts converged on the significance of ISIS as an enduring threat. In contrast, in the present study, the experts consulted now indicate near certainty that the current geographic expression of ISIS will meet its demise. A question remains, however: What do these experts believe will happen next? Can ISIS exist without territory? What happens to the fighters after ISIS is dismantled? What can the United States do now to prevent the rise of an “ISIS 2.0” after ISIS 1.0’s demise?